Home Blog What can you build with System on Modules (SoM)? In my earlier posts, I have attempted to show how SoMs are more ideal for embedded product development in comparison to SBC and chip-based development. In this post, I will cover where all SoMs can be used and then briefly touch on the portfolio of Toradex SoMs. So, which products can be built using SoMs? Actually, any industrial product that requires more than one of these: graphics support, external memory, cache, few hundred MHz processing speed, video, audio, I/Os (e.g USB, Ethernet, etc. ), WiFi, a feature-rich OS, communication stack, 3rd party frameworks (e.g Qt, etc. ), can be built using SoMs irrespective of the type of industry, and end-application. A microcontroller cannot match up these requirements. You need a processor or System on Chip (SoC) to address these requirements. Among the 3 ways you can opt for developing your product using a SoC: Chip-based (or full-custom), SBC-based and SoM-based, the SoM-based development has an edge over others. However, there are few exceptions to my last statement. We have typically seen that product with sales volume up to 10K per year (or even 50K year with low-cost SoM variants) are ideal to be built using SoMs. With higher sales volume, OEMs or system designers are more inclined to go full-custom as they can better optimize the design based on the budget and project requirements. Another factor that make custom designs more favorable is specific end-application requirements such as advanced signal processing, which may need some DSP cores. One more aspect to be considered is the scalability of the platform. In case the product is planned for a single cycle and no more variants or updates are expected in future, then chip-based development or SBC may be a good option. However, if scalability of the platform is needed, then SoM is a better option for seamless and cost-effective upgrades. These SoMs are application agnostic, and thus can be used in diverse industries such as Industrial Automation, Automotive, Medical, Transportation & Logistics, Test & Measurement, Marine, Aviation and many more. To cater to the varying needs of these diverse industries, we have 2 product families of SoMs based on Arm architecture: Apalis and Colibri. The Apalis family is targeted for high-end applications that need advanced performance and superior graphics, along with support for high-speed I/Os such as GbE, PCIe, SATA, USB 3.0, etc. Apalis SoMs can be used in digital signage, gaming consoles, flight cabin systems, and many more high-end applications. 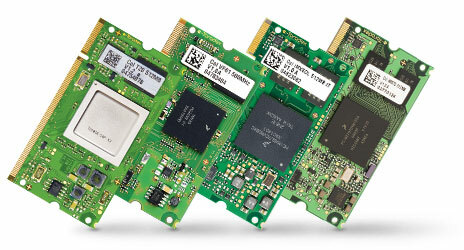 The SoMs are based on NXP®/Freescale i.MX 6, NVIDIA® Tegra™ 3 and soon the NVIDIA® TK1 processors. 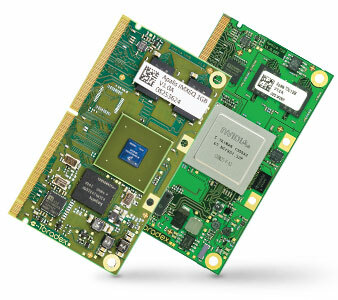 The Colibri family offers small form-factor SoMs that are ideal for low to medium end applications. Some prospective field of applications for this family includes retail PoS devices, Lab equipment, Home-automation, medical devices, etc. This family offers an extensive series of pin-compatible SoMs based on NXP®/Freescale Vybrid, i.MX 6, i.MX 7, & NVIDIA® T30, T20 and Marvell® PXA processors. You can easily scale up or down your platform and introduce multiple cost-performance optimized product variants based on the same platform without much change in hardware. The pin-compatibility among these SoMs makes technology upgrades as easy as plug-and-play. I know that there can be a claim that hardware is a commodity and any company with good hardware expertize can put together a SoM family based on variety of processors. So, what makes Toradex different? We also accept that hardware basically is a commodity. Our real value addition is that we complement our robust hardware with pin-compatibility and even more with an excellent software support. Actually, we devote around 85-90% of engineering resources on offering you a matured and stable Board Support Package (BSP). You can easily reduce your time-to-market by around 10-12 months in comparison to development time with full-custom designs, by using our SoMs in your projects. Your project is almost limited to the enhancing the user-experience and value addition of the end-application. We take care of the remaining essential design commodities: hardware, OS, BSPs, and device drivers. Stay tuned for my next blog, where I will elucidate about our software support.